The Greenville Creek was running fast and deep on the day I approached Bear’s Mill. The dark original walnut siding was decorated for the season. Stepping in from the cold a warm atmosphere and friendly staff made me feel instantly welcome. This mill is one of the only working mills in Ohio still using water as a power source. 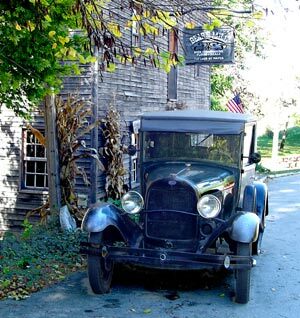 The land was first owned by Major George Adams who created a sawmill and distillery along the bank of the creek. 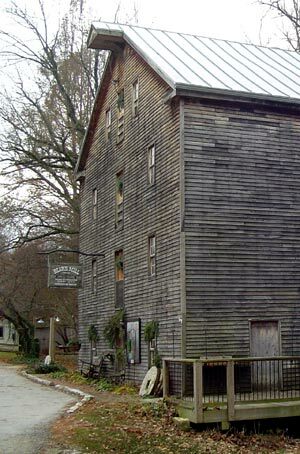 Gabriel Baer purchased the mill in 1849 but somewhere in time the name Baer’s Mill became Bear’s Mill. Julie and Terry Clark (the Master Miller at Bear's Mill) purchased the mill over 25 years ago and after 2 years of restoration they reopened. Today, the mill is listed on the National Historic Places Registry. The slow cold grinding process offers freshly ground flours and meals in the same manner as 150 years ago. The mill specializes in wheat flour, yellow cornmeal, cracked wheat and rye flour all ground on buhr grinding stones. Its these hard granite stones that keeps the flavor and nutrients usually lost in modern rolling methods. When you visit be sure to ask about the mills cornbread recipe, I’m sure they will share it with you. The main floor presents visitors with a selection of unique gifts including artwork, pottery, handmade soaps and candles. Julia Clark has her own pottery studio on site. Loretta Wray of Laura Ohio, Pamela Ridenor of Tipp City Ohio, Carole Fox of Sugar Creek Ohio and Diane Browler of Troy Ohio are all Ohio potters displaying their work at the mill. Walking around the outside of the building you will be able to see the impressive head water just above the mill. Visit the memorial honoring the men who served in the Vietnam War and you will find a place to sit, rest and reflect. The mill is a bit out of the way but welcomes your visit and needs your support. Born in Virginia George Adams became a drummer boy during the American Revolution. He would rise in the ranks of the new American army fighting along side of General Harmar and fighting valiantly at St Clairs defeat at the Wabash River. Major George Adams would be with General Wayne at the Battle of Fallen Timbers and witness the signing of the Greenville treaty. During thistime he came across the land along Greenville creek and a few years later by a Presidential deed, for his military service, President Monroe gave the Major the land along this fast moving creek. Adams would build a mill and distillery and would spend the remainder of his life here. He is buried in the Martins Cemetery on the east side of Greenville. President James Monroe presents the land to Major George Adams. Terry and Julie Clark saw the old abandon mill and decided to save it. It is their work and love that you”ll see when you visit.